I've been on a short trip to Oahu for a few days so I haven't posted in a while. Upon my return to my craft room, I immediately began whitewashing (with watered-down white acrylic paint) one of the Sierra Pacific kraft paper boxes. 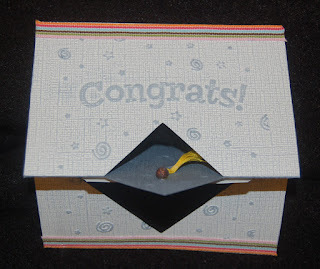 Once the inside and outside of the box was dry it was simple work to cut and tape (Merikan double stick) pieces of Martha Stewart double-sided card stock (from the 'Stitched' pad) to the box (leaving small borders around each piece of printed card stock). All the box flaps are magnetized to close with a click, but I wanted to make a pull of some sort to make opening the box easier. My solution was to hang a MS tag (stamped with 'Friends Forever') from a whitewashed wooden spool (extra twine was wrapped around the spool). This tag can now be pulled to open the front flap. (Oh, the strawberries on the tag were carefully removed and re-glued so the tag could be hung vertically.) 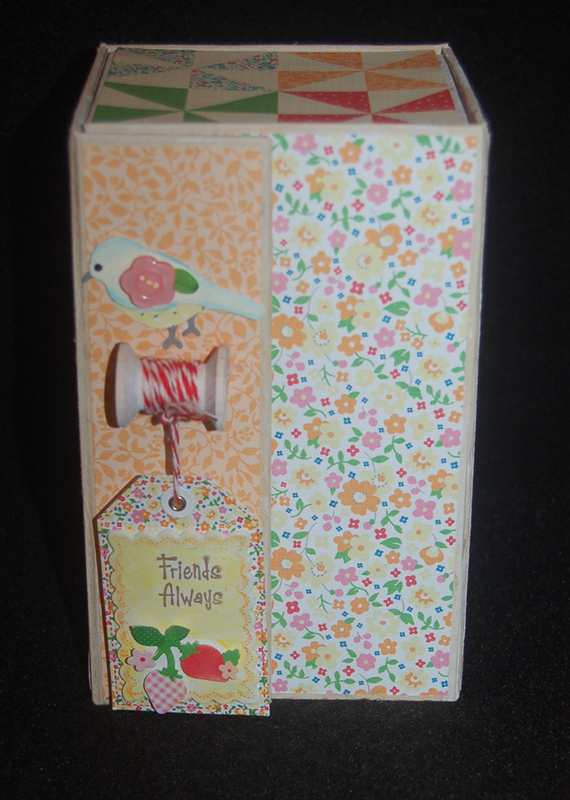 A Martha Stewart bird sticker with a flower button were added for more visual interest. Because the light yellow color of the bird sticker was not quite right I added some color with a blue watercolor pencil. The hanging tag color was also changed with a yellow color pencil so it wasn't so white. 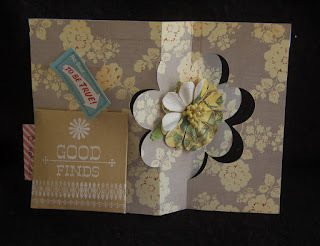 I am pleased with the outcome of this project and I think the whitewashed interior of the box complements the vintage-fabric look of the card stock. 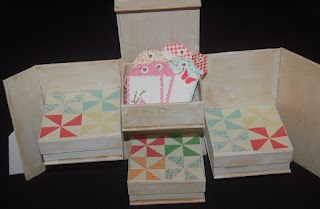 This easy-to-make box will make a perfect holder for gift tags or sewing notions and all the supplies were purchased at a reasonable cost from Ben Franklin Crafts. Have a happy crafting weekend! Last week even though I worked on several craft projects, none of them resulted in a finished product worthy of showing in a post. Sometimes crafting is like that. Oh well, I'll keep working on the leather cuff and smash-style picture frame, but I will need to reevaluate my procedures. In the meantime, I decided to do some shopping therapy at Ben Franklin Crafts. I was pleased to find that the Martha Stewart line had some new (to me) double-sided 12x12 paper pads (two shown in the top photo, one with birthday designs and the other with small printed flower fabric-like paper) and matching embellishments. Also new are two products show in the foreground of the first photo. 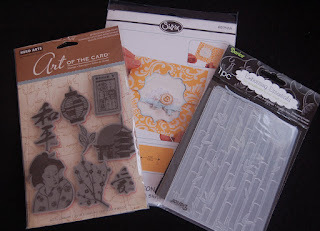 The one on the left is a paper piercing embroidery type kit for paper crafting and the one on the right is a unique floral stamp set that has a plastic template which allows you to space your design evenly around a card. I haven't tried these products yet but I will post my results if I create something good. 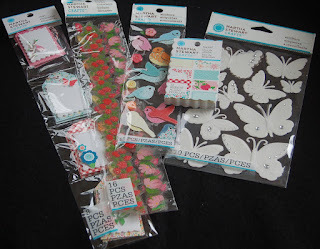 Of the stickers, labels, borders, and tags in the second photo, I think my favorite are the fabric-like bird stickers....so tweet! The white butterflies match the paper pad that I didn't purchase, but I got the butterflies to use on wedding or sympathy cards and may try to color them with spray inks. 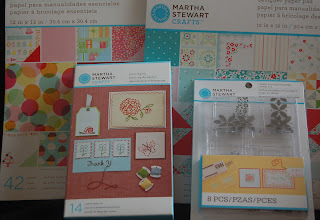 Even though I went shopping to buy the Sierra Pacific kraft paper box that Joy (http://joyofcrafting.blogspot.com/ ) decorated and posted on her blog (I got 3 because they were only $2.99), purchasing all these colorful Martha Stewart products really lifted my spirits from a less than productive week. 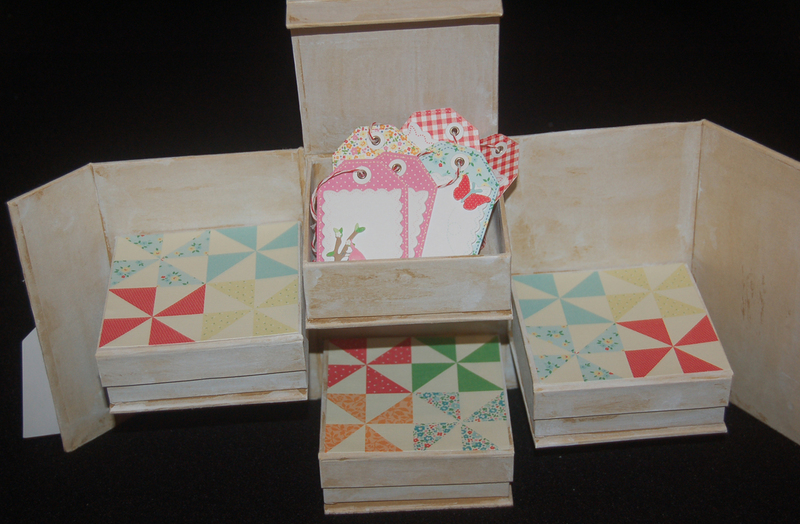 Tomorrow I'm anxious to use the new MS papers to cover one of the SP boxes...it will be a GOOD craft day! To me, flowers are nature's most beautiful craft product. Recently, my very sweet neighbor, Laura, left a bouquet of gorgeous lilies and orchids (not in photo) at my gate. Looking at them for a week now has made me smile every morning. At first, I left the flowers in the vase that they arrived in but a few days ago I had a serendipitous find in a shop in downtown Hilo. 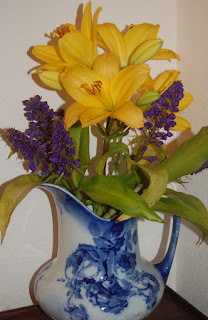 The pitcher that the lilies and blue gingers are in now was purchased for a mere $10! What's even more amazing is that the pitcher is over 100 years old....so it is REALLY an antique. Because I am a collector of blue and white Victorian ceramics (especially from England), I was extremely surprised to find this treasure in Hilo (usually I need to travel far or visit Ebay to purchase a piece like this. (This piece was clearly marked on the bottom with the place of origin, production date, and pattern name. A quick check on the internet can be an invaluable aid in determining age and value.) The fine hairline crack in the pitcher and the fact that it is part of a wash basin set, account for the less than $500 price, but it still was a bargain and one that has a practical use, too. Anyway, the point of this post is to remind you to find joy in the simple things and to keep your eyes and mind open for treasures which are everywhere if you just look. May you find just what you are looking for to make you happy! I meant to post this on Father's Day (hope all you dads had a good one), but I got caught up in cooking for my husband. I decided, since my hubby is not much of a consumer (except for food), I would spend the day cooking all his favorite foods on Father's Day. 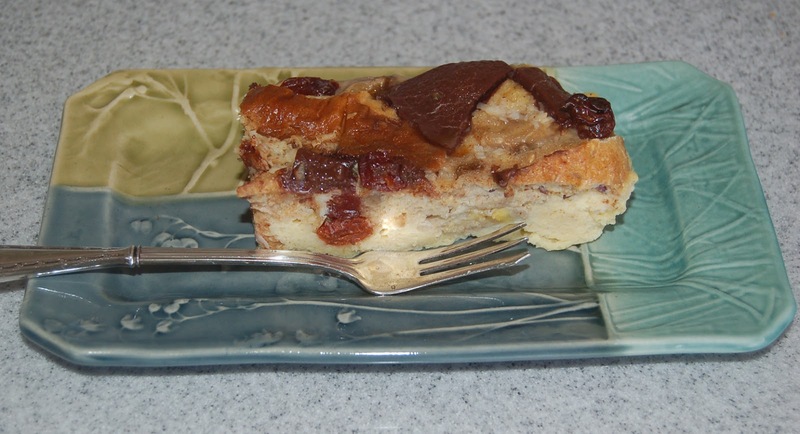 Breakfast started with banana bread pudding (made the night before) which was made healthier with the use of whole wheat bread mixed with slices of Punaluu sweet bread. 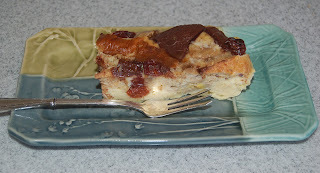 The sweetness was achieved with the inclusion of dried cherries, banana slices, bittersweet chocolate and a bit of Splenda. 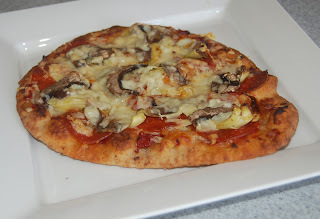 It was easy to make a specialty pizza using Stonefree whole wheat naan bread as the crust. Tomato paste, pepperoni, cheese, mushrooms and marinated artichoke hearts were the ingredients that made this pizza delicious. It only takes about 10 min. in a 400 F degree oven to get this cooked to a bubbly, crisp perfection. both trying to lessen our sugar intake so I needed to figure out how to make a luscious looking dessert lower in sugar. I made the cookies using whole wheat flour, macadamia nuts, coconut (his favorite flavor), almond flour, and Splenda Blend so they were much healthier than the original recipe but just as tasty. The ice cream is a triple chocolate Dryers Splenda version; it's yummy! 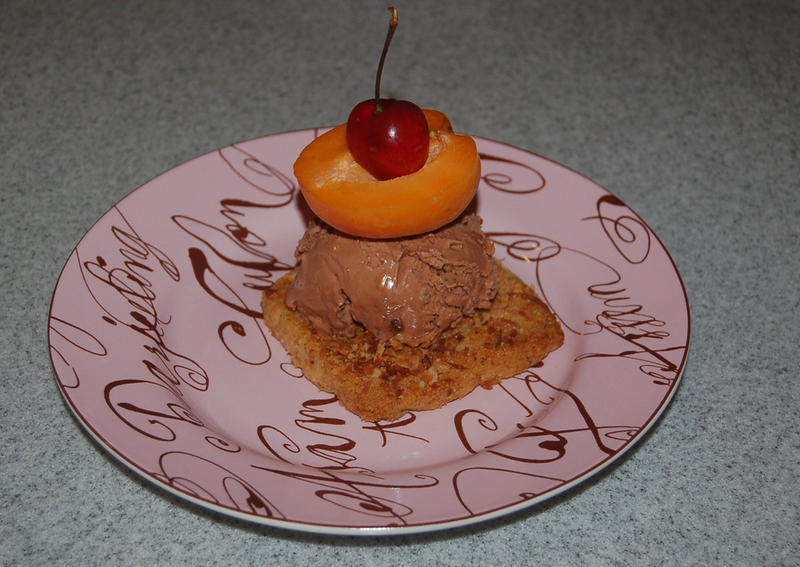 To fancy up the dessert with just a few calories, I topped off the dessert with half of a fresh apricot and a fresh cherry with the stem on. I almost forgot to make a Father's Day card because of the thinking I was doing for the cooking, but I came up with a quickie that I think expresses what my boys and I think about my husband as a father. (The typewriter printed words were stamped using a Hero Arts alphabet set from Ben Franklin Crafts.) 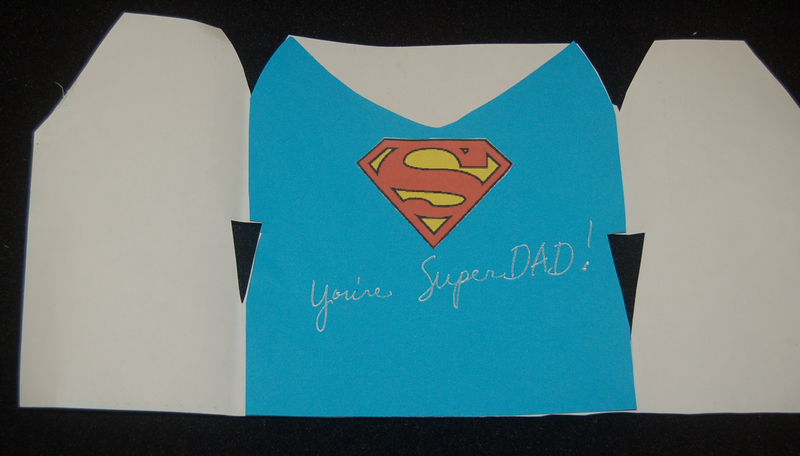 The silver ink on the Superman shirt is barely readable in the photo, but it says, "You're Super DAD!". Over the years my husband has served as a dad for me, too and you just can't imagine all the energy he's had to exert taking care of all of us in his high-maintenance family. Thanks DAD! I have some exciting news for crafters on Oahu. The Celebrations store (a few doors down from the Mapunapuna Ben Franklin Crafts store, 2810 Paa St. Ste. 2) is holding gift wrapping classes! These special classes will be taught by an instructor from Japan. The classes will be held on June 29 (Friday), June 30 (Saturday) and July 1 (Sunday). You must register for the class or classes at the Celebrations store. A single class costs $35 and multiple ones are $30 each . Class fees include materials and tools. 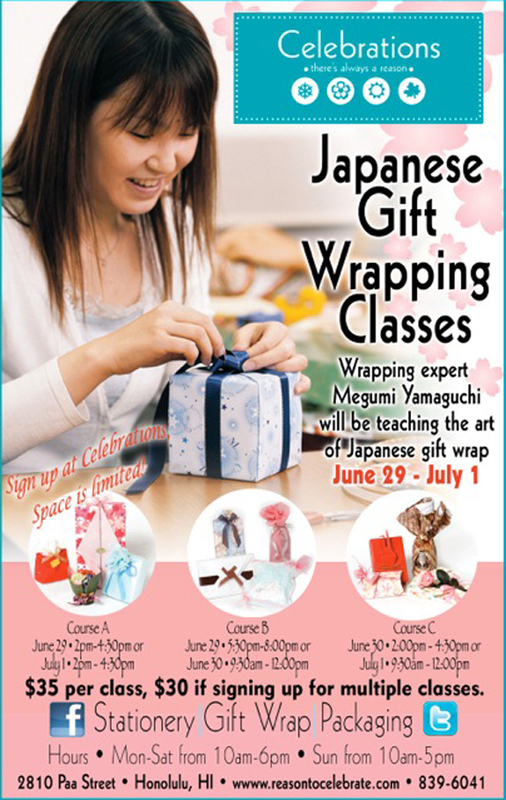 Don't miss out on this crafting opportunity to learn sophisticated ways of presenting your gifts with beautiful gift wraps. 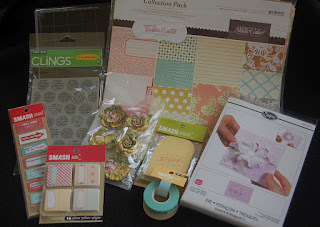 I purchased SMASH (K and Co,) products awhile ago, but never got the crafting urge to use them as I only thought of them for scrapbooking (which always seems like such a daunting task). 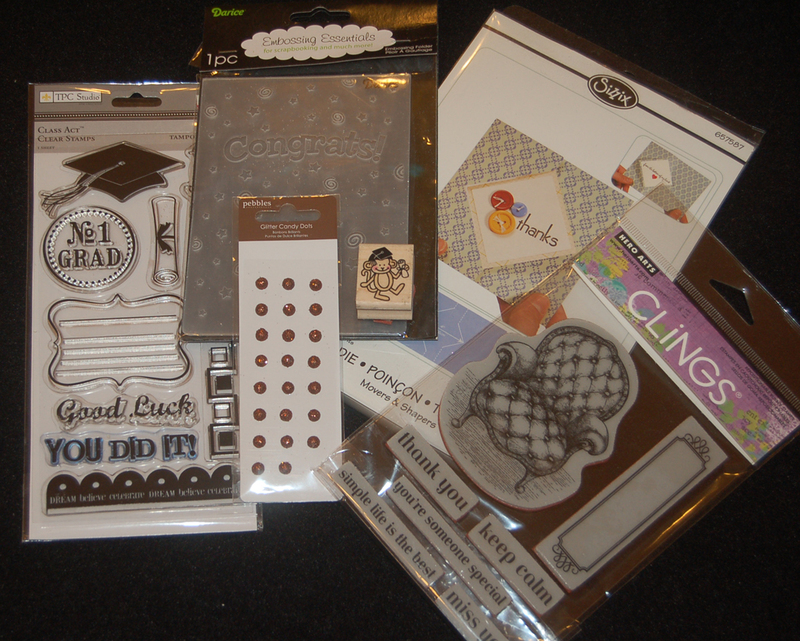 Recent papercrafting publications have featured Smash items on and in simple do-what-you-want journals and mini books. 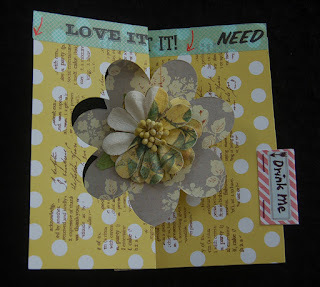 I've taken the product to another even simpler use.....cardmaking! 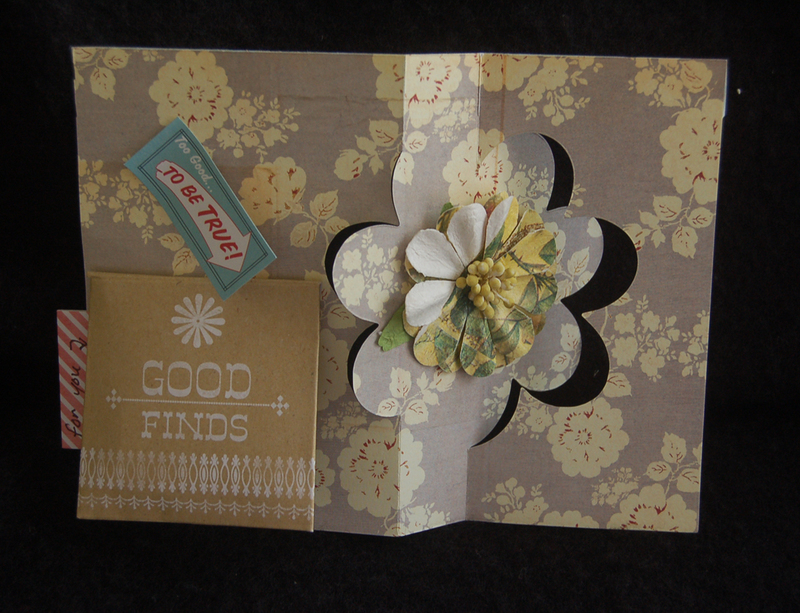 Next I added the Prima flower and Smash product embellishments including tape, a tab, a sticker, and a pocket. 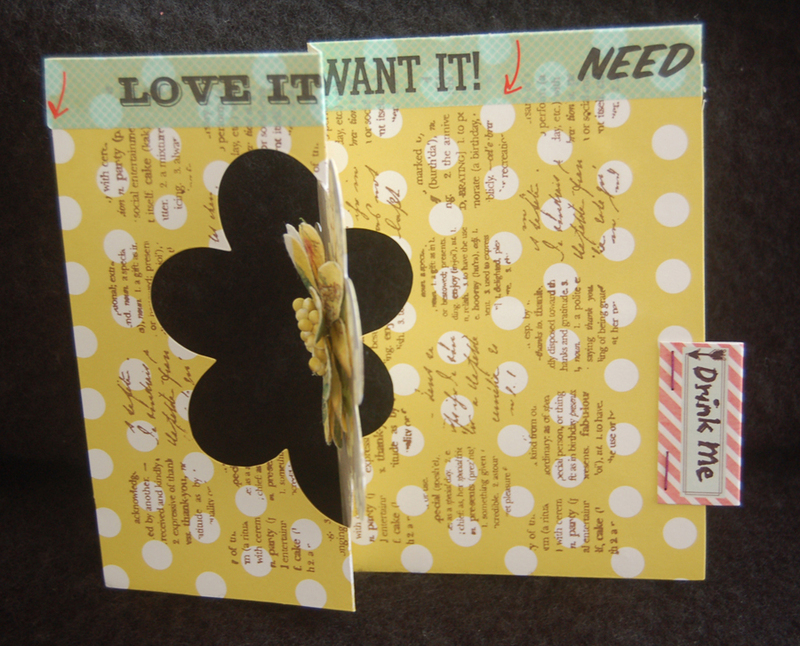 I stapled on the tab and wrote 'Drink Me' on one side and 'for you' on the other because I filled the pocket on the back of the card with a tea bag. All the colors and parts seemed to effortlessly go together because they have the vintage look. All the products used on this card are available at Ben Franklin Crafts (the double-sided card stock comes in single sheets too) so you can easily get going on your own Smashing card. I know you're going to love making cards and other crafts using this anything-goes Smash method. Have fun today...craft something that makes you smile! Ben Franklin Crafts Gift Card Winner! 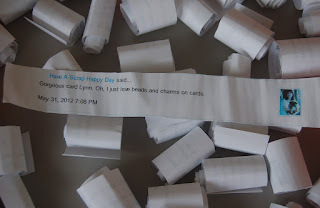 I almost forgot that I had chosen May as the month to put all the comments to my blog into a box and draw one name for a surprise prize of a gift card to Ben Franklin Crafts. For those of you who are new to my blog, I pick a random month and then pick a winner from that month's comments. If you left one comment in May you will have been entered one time or if you wrote 20 comments you will of course have 20 chances to win. Without any further ado......drum roll please.....the winner is.....Karen who has the fabulous blog called, Have a Scrap Happy Day. Congrats Karen! (Please send me your mailing address via my e-mail address, lsakami@aol.com so I can mail you the gift card). Karen comments on my posts frequently, but oddly it was her very last comment to me in the month of May which was randomly selected (very low-tech...see photo). Thank you everyone who takes the time to boost my craft spirit by sending me a sweet comment; maybe next time your name will be chosen as the lucky winner of a Ben Franklin Crafts gift card. While visiting Maui, I had a few minutes to spare so I popped into the Kahului Ben Franklin Crafts store. I didn't expect to find anything that I couldn't get from the Hilo BFC, but I did! 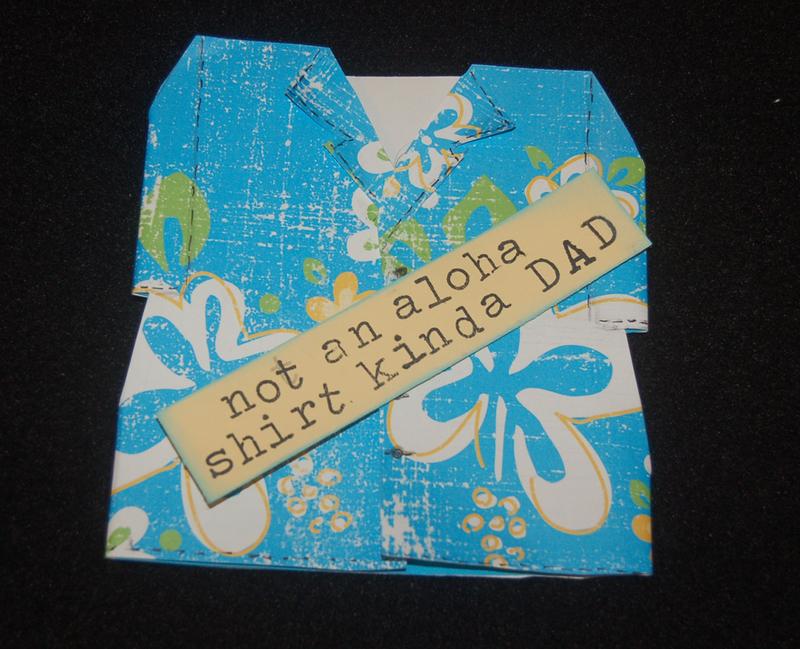 I purchased a Sizzix flip card die that had sold out at the Hilo store and used it to create this card. 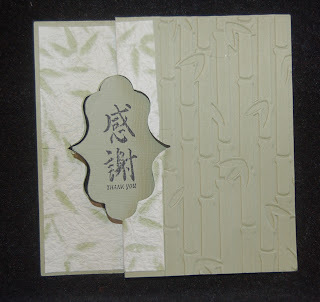 First, I embossed part of the die cut card base with a bamboo embossing folder from Darice. 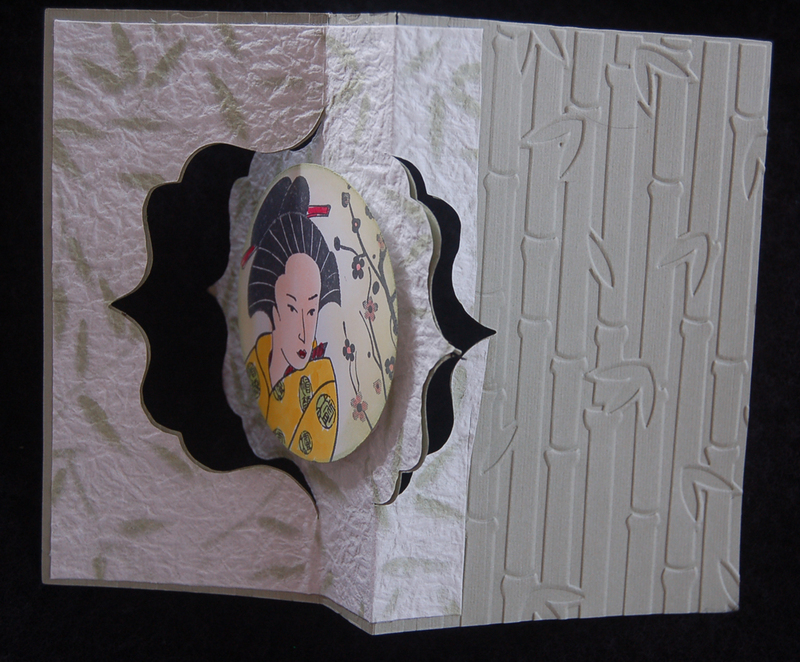 Next, I cut a second card from a piece of printed Japanese paper and cut it to fit the side of the card that was not embossed. (Three sides of the printed paper were trimmed to show an eighth-inch border.) 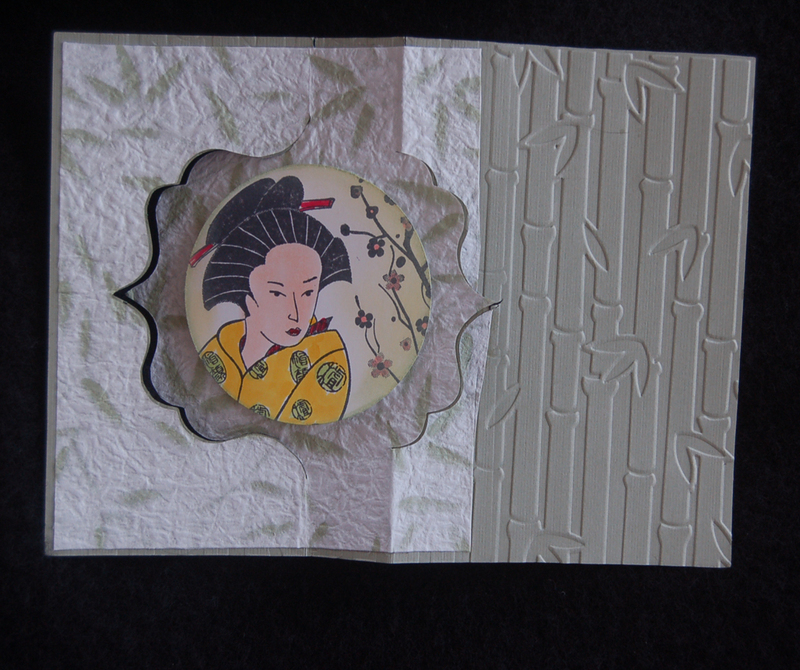 The Japanese lady and cherry blossom branch (Hero Arts set) images were stamped onto marker pen paper, colored with Copic pens, cut out with a circle punch, smudged along the edge with ink, and adhered to the card with pop dots. 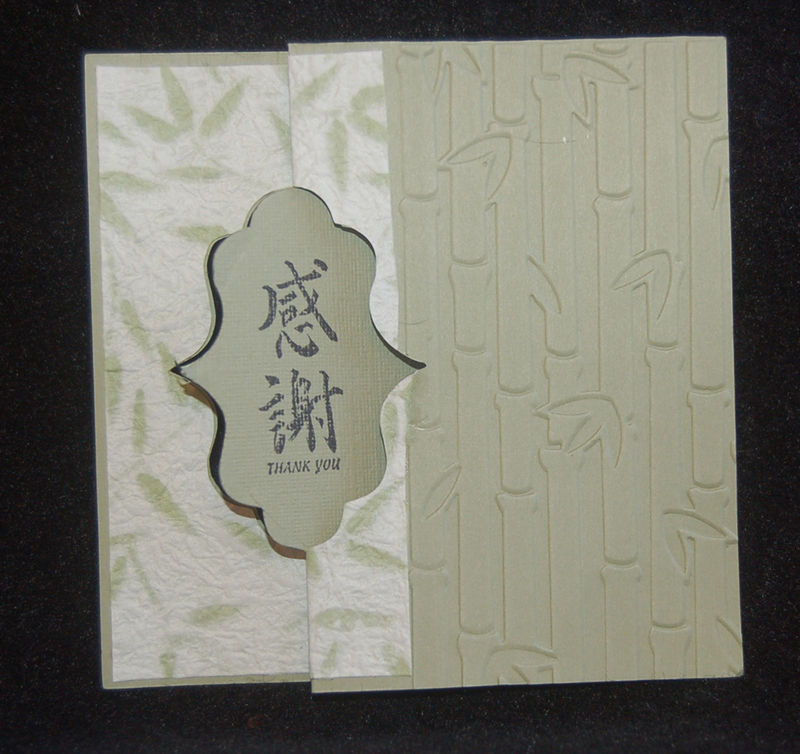 Finally, a Japanese character stamp (thank you) was stamped in the small cartouche on the front of the card. This card was a cinch to make because of the super amazing Sizzix flip card die. Thank you for visiting this site and I hope that you will return to see what other great items I found at the Kahului BFC and learn what I crafted with them. I love playing with new craft toys and I recently finally got my hands on three of the new Sizzix flip card dies: flower, heart, and diamond. After cutting out several of each design, I realized that the diamond one looked like a graduation cap. Since I recently acquired a Darice embossing folder with the word 'Congrats' on it, I decided to put the two products together and create one last graduation card. I started with cardstock that has an inner core color so that when you impress designs on it; the design can be revealed by sanding the paper. 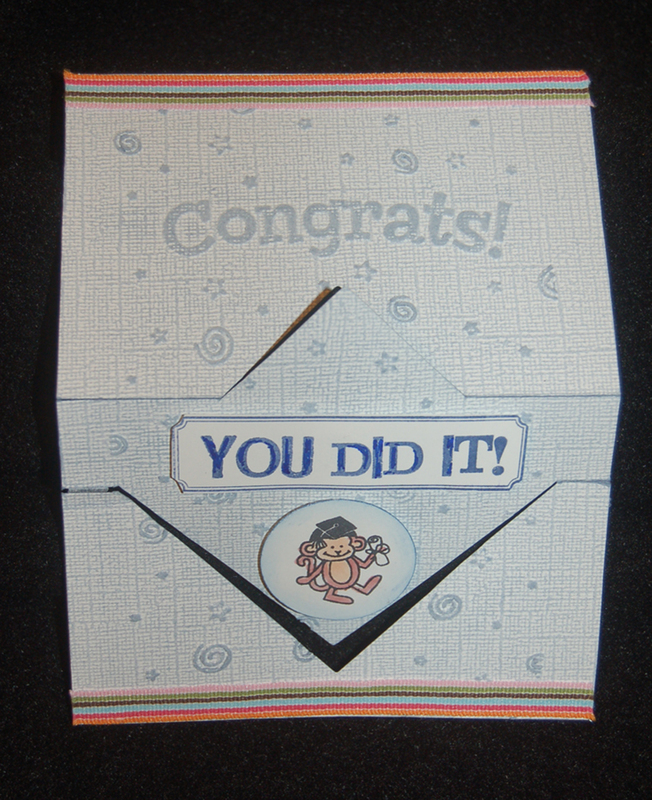 First I die cut the diamond flip card (can be cut from an 6"x 8" piece) and then embossed it in the folder. I had to emboss the bottom a second time to complete the pattern. 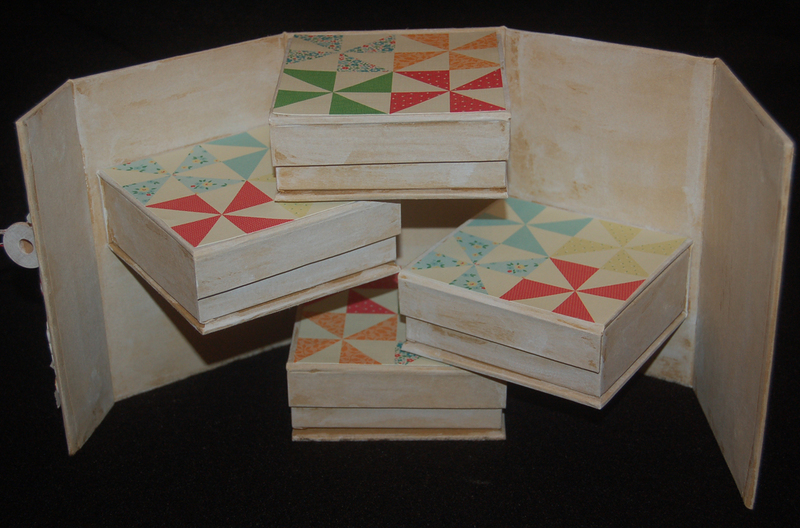 Next I sanded (with sand paper) the embossed design to bring out the under color. 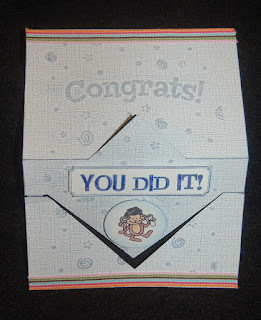 I stamped , colored, and punched out the Dandelion Designs monkey graduate. (Note: The edge of the circle was colored by rubbing an ink pad on the edge and smudging.) The Hero Arts label desgin was stamped on white cardstock and then the words (TPC Studio) were stamped inside. (The ends of the label design were cut off.). The label and monkey were raised on pop dots. 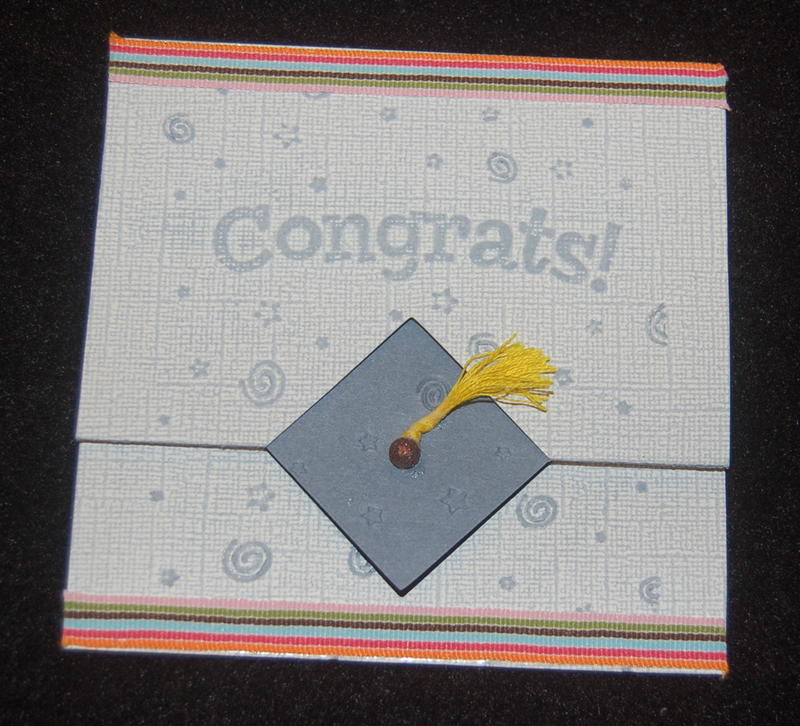 Finally, I added American Crafts ribbons to the top and bottom of the card and attached an embroidery floss tassel (with a Pebbles glitter dot) using Beacon Fabri-Tac glue. This graduation card took very little time to create because of the Sizzix die and Darice embossing folder; both of which can be purchased at Ben Franklin Crafts. I hope you liked this post and will return to this blog again to see how I used the other new Sizzix dies. I wish you happy days of crafting!